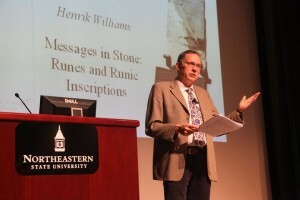 Professor Henrik Williams is primarily a philologist, teaching and doing research in runology, Old Swedish, and Old Icelandic. He is co-editor of a new professional scholarly journal, Futhark: International Journal of Runic Studies. Founded in 1477, Uppsala University is Sweden’s oldest University with an enrollment of 40,000 students and houses the Uppsala University Runic Forum and Database located at: http://www.nordiska.uu.se/forskn/samnord.htm where more than 7000 runic inscription translations are catalogued and coordinated by Williams. View Henrik’s home page here.